I slept really good after my headache went away, and woke up at 0600 this morning, to pack things back up and get ready to head out. We had breakfast (cappuccino and a brioche) and talked to the man running our temp hotel. We stopped by the original hotel, and he promised that they would go pick up our bags today so we can move back where we were supposed to stay. 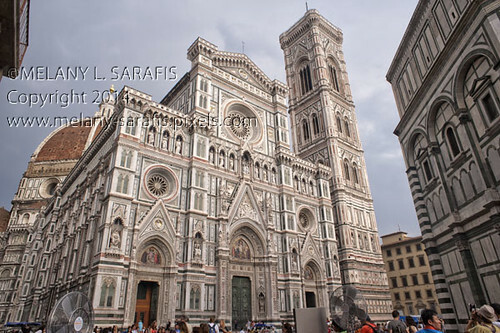 So, we headed out – our first destination was Brunelleschi’s Dome! We got our tickets, and arrived at the door at 0820, 10 minutes before opening – we beat the crowd!! The climb up was hard, I can’t lie! 463 steps = One heck of a cardio workout and not much air. I can’t imagine attempting that climb in the hot afternoon with tons of people!! We stopped to rest a few times, but finally made it out at the top. As we got to the top of the climb, the steps got narrower and became a tight spiral – that was the hardest part of the climb! What a view!! We sat on a bench in the shade up on the dome (I forget what you call the top part of the dome) for a while to catch our breath and let my heart stop beating out of my chest. I took a lot of photos and walked around a few times, in NO hurry to begin the climb back down. The climb back down was a piece of cake, compared to going up. The narrow stairs forced us to keep both hands on the (grimy) handrail or walls. I wonder how many millions of hands touched them before this morning. I wished I’d taken hand sanitizer with me! By then we were ready for a break and lunch. We found a tiny alimentary not far from the Palace that was mentioned in Rick Steve’s Florence book and decided to give it a try. 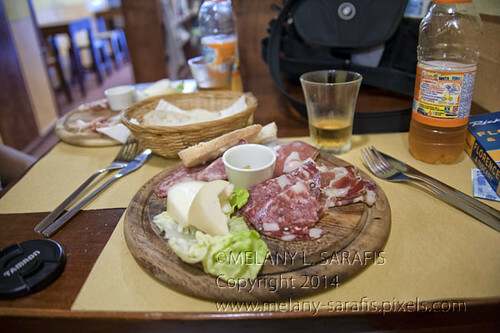 We had anti pasta, a plate with various cold cuts –salami, prosciutto, etc and cheese and bread. One thing that neither of us cared for was a slice of lard (fat) – ewwww! We had cold peach tea, which was awesome! Tony was whining by then “I’m tired!” so we started to the hotel, but decided to stop by the Baptistery and Duomo Museum first. The Baptistery is beautiful inside! The ceiling is a mosaic of gold — I was allowed to take photos there, hopefully I got some good ones. The Duomo Museum was partially closed for renovations, but we saw the original Giberti’s doors that once hung in the Baptistery. They are amazing huge bronze doors with various scenes – I took lots of photos. We also saw Michelangelo’s last Pieta. I have lots of photos of it, too! 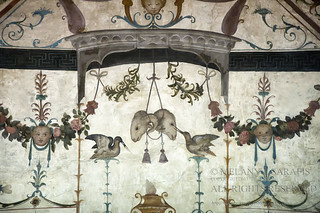 I love when I can take pictures of these works, most museums do not allow photography, but the churches do. We headed to the hotel, and found that they DID move our bags! This room is much nicer than the other hotel, even though it’s a 2-star and the other is a 3-star. I much prefer this hotel, and I really like the people who run it. After resting for a couple of hours – Tony took a nap and I organized a few things, we headed out again. This time, we took our first bus ride up to San Miniato Church and Piazzale Michelangelo. According to legend, St. Minias was beheaded down on the banks of the Arno River in AD 250, and then he picked up his head and walked up the hill to this location. Honestly, if that had REALLY happened, I’m sure he would have bled to death after walking up the hill and getting his heartrate up before getting here 😉 He was buried in what became the first Christian cemetery in Florence. 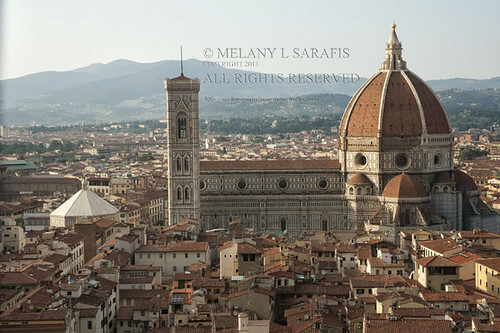 It overlooks the town of Florence, allowing some awesome landscape/cityscape photography. 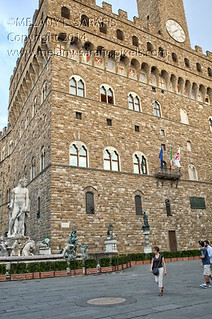 I guess I took too many photos, because just as we were about to enter the door, a Monk came out and said they had to close L. We walked down the hill to Pizzale Michelangelo, another plaza that overlooks the city. A tourist filled area with a HUGE statue of Michelangelo’s David (I think it’s bronze though, and it’s got a great green patina). By the time we got here, we were both starving and decided to get some food, and THEN shoot the sunset. We walked back down the hill instead of waiting for a bus, and found a great pizzeria called I’Pizzacchiere. We had a large “White Tiger” pizza with tomatoes, mozzarella, and ham. Pizza here is nothing like Dominos – the crust is really good, not over sauced or filled with lots of crap. On the way home, we stopped for gelato at a different gelateria. This time, I had Mango, and Tony had Banana and Strawberry. Just like ice cold fresh fruit! So good. We’re back in our hotel, not going to bed at 5:30 this time. Actually, it’s 11:00 and we’re both still up. It’s off to bed soon, because we have a busy day planned tomorrow with an early start. 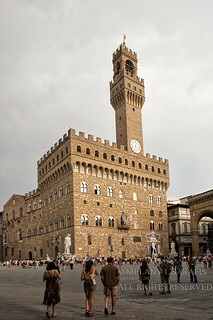 Up first – Uffizi Museum, starring Botticelli (Birth of Venus, and Primavera). So, I’m sitting here in my hotel room in Florence at 1000 PM after waking up with a major headache. The last 30 hours have been hectic! We left Lubbock on 13 July to head to DFW, where we spent the night before heading out on an 0830 flight to Florence on the 14th. The flight was fine, despite a 1-hour late takeoff from Philly which caused us to miss our connection in Frankfurt. The USO in Philly is awesome! We had hotdogs and chips – tasty and free, and sat in comfy chairs while we surfed the net and charged the laptop. The Frankfurt Airport – what a mess! We had to go through security again as we changed terminals. I had 2 unopened bottles of water in my bag that I got from the USO in Philly (not realizing we had to clear security again) that I had to throw away. We walked forever to get to our gate and waited for three hours for the flight. Glad to finally be here on the afternoon of the 15th and off of a plane, we caught a taxi to our hotel, only to find out that they had a pipe burst on Sunday and most of their room were unusable till it’s fixed (hopefully today or tomorrow). They had already made deals with neighboring hotels to put us up for tonight, and we will move back there tomorrow. A pain for me, but I really appreciate that they found us a place to stay instead of saying “sorry!” Very nice people, and I can’t be upset with them. We got settled in our hotel, headed to the IT (tourism) office to purchase our Firenzie Cards, which will get us in all the major museums fro 3 days, and allow us to NOT have to stand in long lines to buy tickets. Expensive, but worth it! I headed across the street to the bankomat (ATM), only to find out that my debit card can’t do international transactions, despite the bank assuring me it would. I had to use my MasterCard credit card to get a cash advance. I think I’ll go inside a bank tomorrow and see if I can use the debit card there to get cash. I managed to get 270 Euros with my credit card, and off we went! I’ve found that my basic Italian is good enough, so far. I was able to verify the local time with my taxi driver, introduce myself to the people at the hotel, and order dinner! Luggage unloaded, cash in hand, camera on shoulder – off we went! First, we came the awesome Cathedral and Baptistery. WOW! I’ve seen photos but to see it in person is amazing – this thing is HUGE and marble. I expected Brunelleschi’s dome to dwarf it, but it didn’t. Another awesome thing, was the crowds around the Cathedral area (but not a good awesome). The line was LONG to get inside. That’s on our itinerary later in the week, I think I may need to readjust it a little. 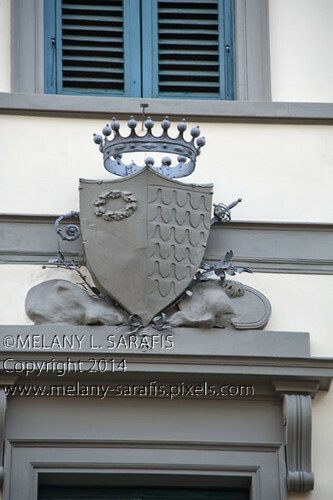 We walked past the Medici Palace, and I was able to peek in through an iron gate at the courtyard. 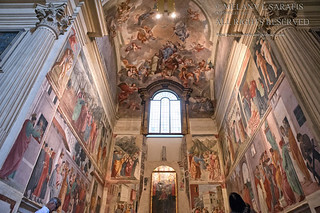 WOW – I knew I was standing on the sidewalk that Michelangelo probably walked on, and was looking into a courtyard where he and Botticelli admired the artworks. This place is also on my list. Onward to Palazzo Veccio, where David stood for 300 years, before being moved to the Academia, out of the elements. There’s a replica there now, and it’s awesome. 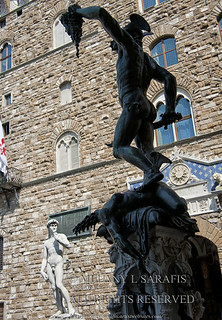 I took photos of many of the statues in the plaza and alongside the Uffizi (I think) museum. It’s amazing! Another crowded place. We headed to the Arno River and Ponte Veccio. That was our destination today, just a little “Renaissance Walk”, and dinner and then a nap after our 30-hour trip. We stopped for pizza in a touristy place (it was just ok, nothing special), walked across the bridge lined with gold shops, and headed back. Before getting to the hotel, we stopped at “Perce no?” (Why not? 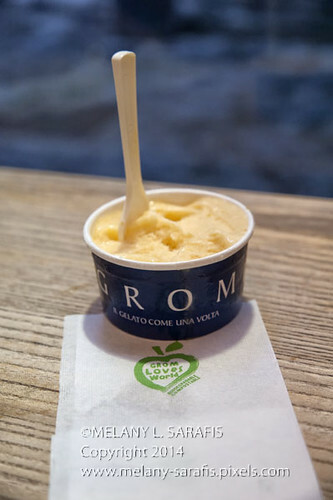 ), a Geleteria I’d read about, for awesome Italian gelato. We each got a cup with cantaloupe and watermelon. Melone (cantaloupe) was my favorite when we lived in Aviano 22 years ago. It was just like I remembered! Fresh, ice cold, sweet, juicy cantaloupe – NOTHING like American ice cream. We walked back through the Cathedral area and crowds, through the horse and carriages waiting for passengers (maybe we’ll take a ride!) and back to the hotel. My foot was KILLING ME, and Tony was cranky – we were both worn out. We turned the light off at 5:30 and went to bed LOL, and I awoke at 8:30 with a major headache. Took an aspirin, ate a granola bar, and typed this out. I’m feeling better now. I think I’ll take a Z-Quil and go back to bead so I’ll get a good night sleep and wake up fresh tomorrow morning. First thing on Day 2 in Florence: Climb Brunelleschi’s Dome!! Ciao, ci vediamo piu tardi!